Citrix® XenServer® is a leading virtualization management platform that lowers the total cost of ownership for desktop, server and cloud virtualization infrastructures. See below to learn about the added value of a licensed XenServer 7.0 product. World class 24x7 Citrix technical support. Note: Perpetual licenses require Software Maintenance in the first year, and is highly recommended in subsequent years. 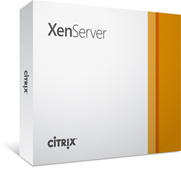 Citrix XenServer is available as Standard or Enterprise editions based on a per socket licensing model, with on-premises subscription license (annual) or perpetual purchasing options. On-premises Subscription (Annual) licenses: An annual license provides one year of guaranteed supportability of the latest stable XenServer release. Annual licenses include software maintenance, which gives customers access to 24x7 worldwide technical support as well as access to all updates and hotfixes via the XenCenter management console. New licenses must be purchased each year. Perpetual licenses: A perpetual license provides guaranteed supportability and upgrade path for the entire lifecycle of the current major version XenServer. Perpetual license purchases require 1 year of software maintenance that gives customers access to 24x7 worldwide technical support as well as access to all updates and hotfixes via the XenCenter management console. Software maintenance agreements can be purchased and renewed after the first year. Leverage best-in-class technologies, including the Xen Project hypervisor, XenMotion live migration, Storage XenMotion, the XenCenter management console and XenServer Conversion Manager for VMware to XenServer conversions. XenServer host infrastructure support has been increased to 5TB host RAM; up to 288 physical CPUs; up to 1.5TB RAM and 255 VBDs per VM. Docker container and guest VM OS support now includes the Debian Jessie release. The XenServer Conversion Manager now enables migrations for all supported versions of VMware vSphere, Microsoft Windows, and Linux. Updates to Microsoft Active Directory integration enables better support for much larger, more complex Active Directory forests. UEFI boot support allows XenServer to keep pace with the currently available technology in today’s modern server hardware. XenServer extends its leadership and innovation in enhanced 3D graphics space with the introduction of new chipset integration: Intel GVT-g (GPU virtualization) support for Windows VMs; expanded NVIDIA GRID Maxwell-gen vGPU support for Windows and Linux VMs (up to 128 vGPU sessions per host, or 16 vGPU sessions (VMs) per GPU, 2 GPUs per card and 4 cards per host); and RHEL, CentOS, OEL & Ubuntu distributions support allows virtualized Linux workloads to now have the same enhanced 3D graphics capabilities as Microsoft Windows. Automate key IT processes to improve service delivery and business continuity for virtual environments, resulting in both time and money savings while providing more responsive IT services. Capabilities include site recovery, high availability, and memory optimization. Ensure the highest performance and data security, especially when integrated with other industry leading products including Citrix CloudPlatform and Citrix XenDesktop. Simplify operations with a complete suite of tools for role-based administration, performance reporting and integration with third-party storage. Citrix is pleased you are considering Citrix XenServer to integrate, manage, and automate your organization's virtual datacenter. Learn how other companies, across the globe, have transformed their business with XenServer. ©1999- 2019 Citrix Systems, Inc. All rights reserved.